Celebrating 15 years in business, eat + drink has proven its presence in the local culinary scene as a place of epicurean delights and has also attracted a loyal following from far beyond. Like some of the artisan cheeses and bottles of wine you’ll find here, eat + drink keeps getting better with time, and it’s where you’ll want to come this winter for a café-style lunch, cheese plates and charcuterie boards, comforting soups and warm Panini sandwiches served into the early evening. To get a taste of the best from eat + drink, sit down for a bowl of house-made soup, such as the carrot and ginger soup topped with a fresh squeeze of lime and pomegranate seeds that pop with flavor. 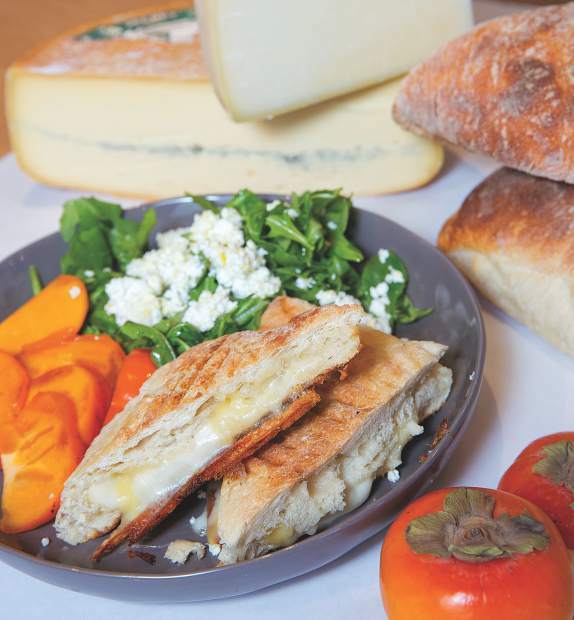 Cheese is a reason for existence at eat + drink, so bring a friend to sample from cheese plates to your heart’s content, or savor the gooey goodness of the Fromage-Lover Panini, a runaway favorite that rises well above an ordinary grilled cheese. With $10 Living Room Pours — a full 10-ounce glass of rotating select house wines — you’ll want to stay and sip through the après hour with snacks and small plates including flatbreads, meat- and cheese-stacked toasts or the beloved burrata. “We’re passionate about what we do, and it shows in every plate and glass of wine we pour,” says Pollyanna Forster, who co-owns eat + drink with husband, Chris Irving. “We also work directly with cheese and wine suppliers to cultivate relationships with others who show great care for the animals and land they tend.” That level of care is something you’ll taste at eat + drink in every bite and sip. The deli cheese counter here is bursting with more than 100 artisan cheeses, many of which you won’t find elsewhere, making eat + drink a must-visit when you want to wow guests with an out-of-this-world cheese selection, or when you just want the very best for yourself. For standout pairings, peruse the selection of more than 500 wines, or choose from a carefully curated beer and spirits section, which includes quality finds such as the Vermouth del Professore. Finally, at eat + drink, the shelves are stocked with ready-to-go fondue kits and specialty food items—raw honey, crisps, chocolates—that make it possible for you enjoy eat + drink even after returning home. Located next door to eat + drink, and with the same owners, is cut. A classic butcher shop with a modern sensibility, cut offers a goggle-worthy array of seafood, prepared foods—think crab and salmon cakes, oven-ready escargot, sausages galore—and the freshest quality cuts of meat available. Cut’s dry-aging process is being received with raving results, making available full-flavored, 45-day-aged N.Y. strips, ribeyes, and more. Cut also creates seafood towers for all budgets; choose from oysters on the half shell and lobster to customize with your favorites. And don’t miss out on the to-go poke, made to Polly’s high standards with lush Big Island ahi tuna, a bit of spice, and sweet Maui onion.